Mike Olt's get the game-winning RBI with a single to center field as Portland rallies to a 4-1 win. Mike Olt hit a ground single into center field for a walk-off RBI in the 10th inning Saturday night in the Portland Sea Dogs’ 5-4 win over the New Hampshire Fisher Cats before 5,812 at Hadlock Field. Elih Villanueva (5-5) pitched out of a bases-loaded jam in the 10th and was the winner. Sea Dogs starter Henry Owens had his second-longest outing this season, going 62/3 innings, allowing four runs (one earned) on four hits, four walks and a hit batter. He struck out six. Danny Bethea of Portland homered in the third inning to make it 1-1. New Hampshire got three unearned runs in the seventh, with an error, walk and hit batter. New Hampshire starter Thomas Pannone allowed three hits over seven innings, but reliever Jose Fernandez gave up three runs in the eighth. Singles by Deiner Lopez, Danny Mars, Cole Sturgeon and Josh Ockimey fueled the rally. Mars walked to begin the 10th, reached second on a bunt and scored on Olt’s single. NOTES: The Sea Dogs moved their Field of Dreams promotion from Sunday to Monday because of Sunday’s forecast for rain. Sunday’s game is still scheduled for 1 p.m. Monday’s game is also at 1 p.m. The Field of Dreams features players emerging from a “cornfield” in center field, then mingling with fans in the stands. Fans who want to exchange Sunday’s tickets for Monday should call the ticket office at 879-9500. 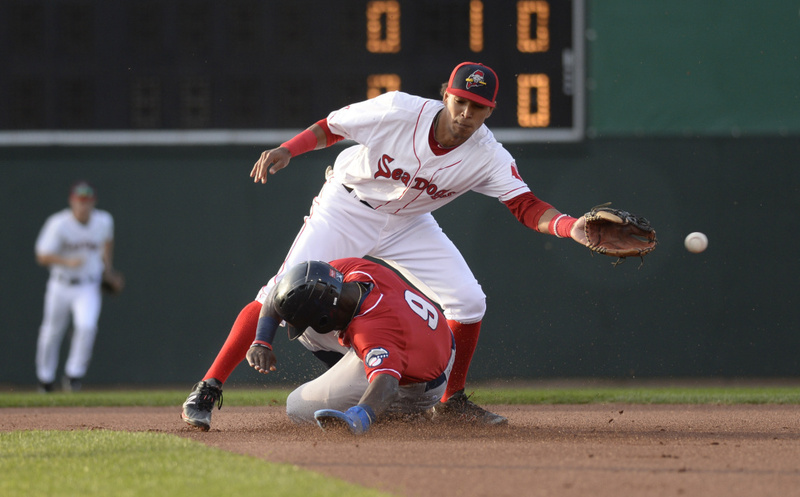 Sea Dogs home run leader Jeremy Barfield was promoted to Triple-A Pawtucket, helping replenish the PawSox roster that’s losing players to Boston. Barfield, 29, hit 27 home runs in only 92 games (he signed in late May). 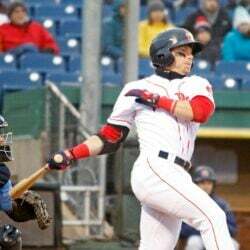 … Barfield went 4 for 5 with a home run Saturday for the PawSox. In the Red Sox organization, Barfield’s 28 homers only trails the 30 hit by Bryce Brentz (Pawtucket) and Michael Chavis (Salem and Portland). Barfield actually has 37 homers this year, counting the nine he smacked in the independent leagues. Former Sea Dogs reliever Jamie Callahan made his major league debut Saturday with the New York Mets, pitching two-thirds of an inning (three hits, one earned run). Callahan was traded to the Mets in the Addison Reed deal July 31. … Callahan is the fourth member of the 2017 Sea Dogs to reach the majors, joining utility player Tzu-Wei Lin, third baseman Rafael Devers and reliever Austin Maddox, all with Boston.